You’re only 4 simple ingredients away from enjoying this delicious cherry recipe – Cherry Vanilla Ice Pops, to be exact! It’ll be your go-to treat when you want to cool down this summer! Plus, these ice pops are vegan and gluten free! Let’s make ’em! Hey peeps! 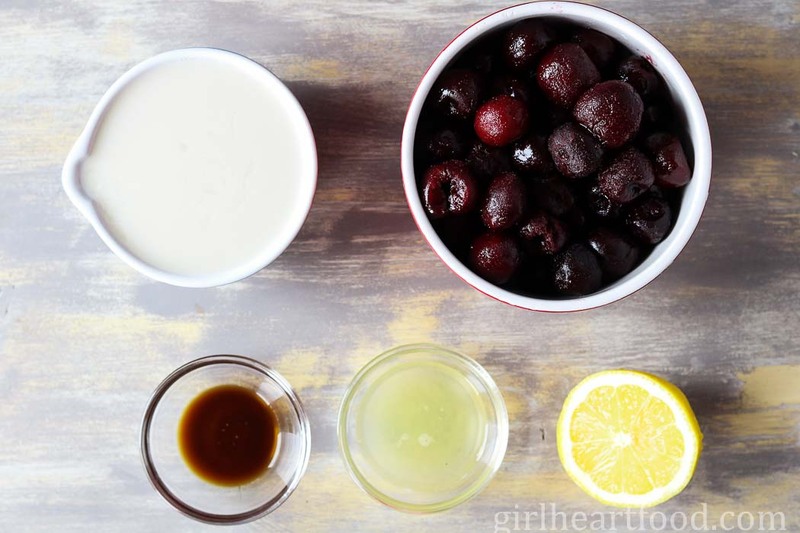 When you think of cherry recipes, what do you normally think of? For me, it’s usually pie. Though, when I have fresh cherries on hand, they don’t usually make it to any recipe – they go straight from the fridge into my pie hole, lol. Today I’m bringing you these yummy perfect-for-the-season Cherry Vanilla Ice Pops. I used vanilla almond milk in this recipe to make the pops ‘vanilla’ey’. If you prefer to use regular milk or regular almond milk, that’s ok too, but they won’t have as much vanilla flavour (I totally recommend the vanilla almond milk, though if you can get your hands on it). If not, add a little more vanilla extract. It’s better to add a little at a time (drops) and taste before freezing. 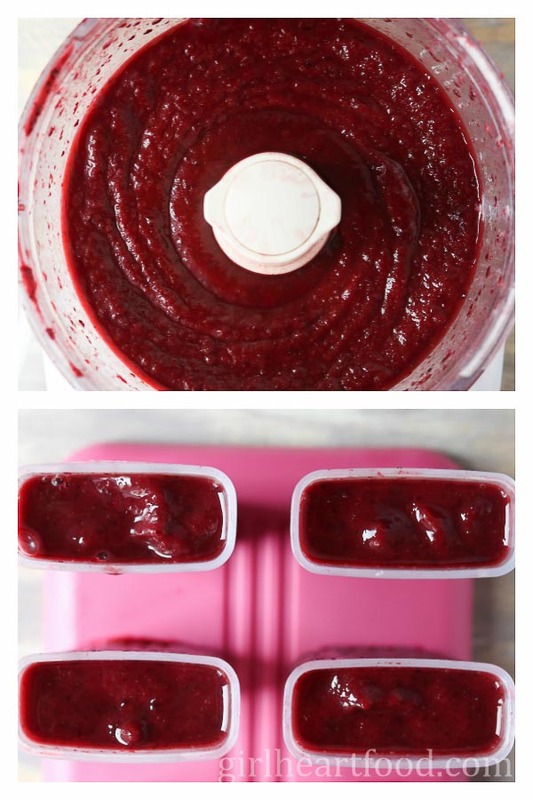 For this cherry recipe, I used frozen pitted cherries. You should be able to easily find in the frozen fruit section of your supermarket. I used 5 ounce molds and yielded 5 ice pops. If your molds are larger or smaller, the quantity of ice pops you yield will vary. I didn’t add any extra sugar to these ice pops. For me the flavour was sweet enough. However, if you like things a little sweeter, add maple syrup to taste. Not only do these cherry vanilla ice pops taste fabulous (I mean, REALLY good), the colour is just so stunning, don’t ya think? They literally take minutes to whip up and the hardest part is waiting for them to freeze. Patience, my pet, patience. I seriously lack in that department. Buuuuuuut, trust me, it’ll be worth it! Hope you love these Cherry Vanilla Ice Pops as much as I do! Don’t forget to subscribe to stay in the loop on all the latest recipes! And check out my fellow blogger friends’ recipes for more ice pop inspiration! Check out the deets on this yummy cherry recipe below! 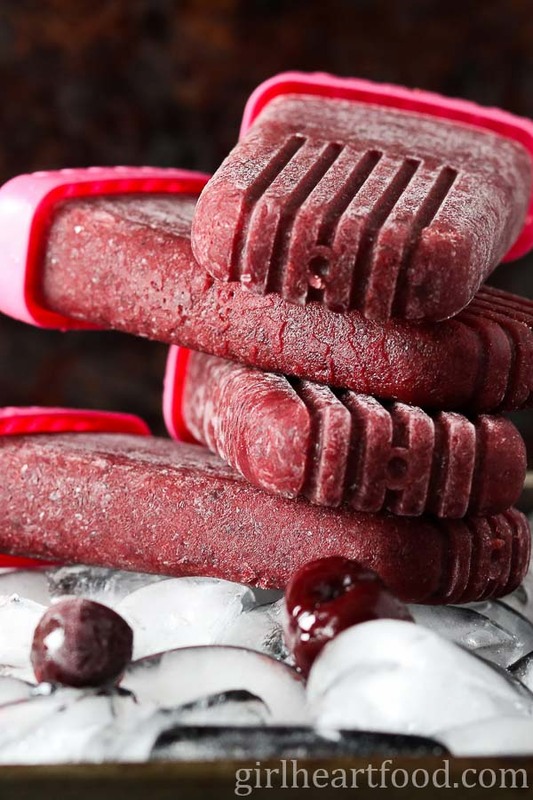 You're only 4 simple ingredients away from enjoying these Cherry Vanilla Ice Pops! It'll be your go-to treat when you want to cool down this summer! Place all ingredients in a food processor and blend until combined and smooth, about 1-2 minutes. Carefully pour mixture into ice pop molds (this recipe yields 5-5 ounce pops). Freeze for 4-6 hours until firm. Run ice pops under warm water for a few seconds to release from mold. Enjoy! 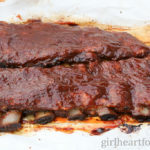 For this recipe, I yielded 5 5-ounce pops. If your pop mold is larger or smaller, the quantity you yield will vary. These popsicles look so delicious! Wish I had one right now! I pretty much eat my weight in cherries during cherry season. This looks like a delicious way to consumer more cherries! Can’t wait to try! I love real food treats like this! Your photos are beautiful, too! Me too! Thank you so much, Cathy 🙂 You’re so kind! Love the simple idea of using vanilla flavored almond milk to give it the vanilla-y flavor! And then I guess you’ve got a touch of nuttiness to it, too. Love it! We totally need this now in the heat! Thank you Lisa! They really are delicious 🙂 Hope you get a chance to try ’em this summer! I just wanna sink my teeth into those cherry vanilla pops! Dawn, gorgeous photos – they have me beside myself, drooling, of course! Like you, when I think of cherries, the first thing that pops into my mind is pie too with gobs of ice cream – but this is so much better for me! And only 4 ingredients!! So yum! These look and sound amazing, Dawn! I’m a total sucker for anything that’s cherry flavored, so this has me all heart-eyed. I’m totally making these once I plow through my Thai iced tea popsicles! Yay!! My batch is all gone so I have to make some more 🙂 Hope you love them, Dana! These photos are GORGEOUS! The color is amazing. Just look at that rich red color! 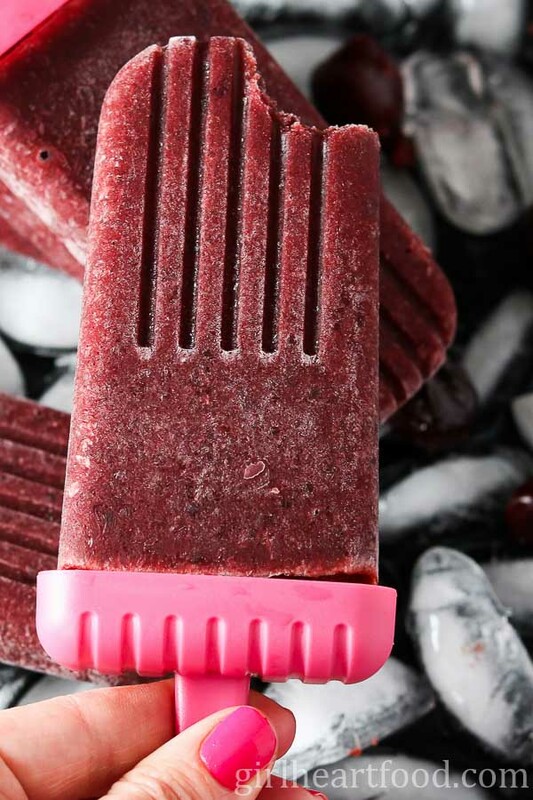 The flavor combination of cherry and vanilla is heavenly, especially in popsicle form! These are just gorgeous! I used to make a lot of popsicles when my kids were little, but now my grandkids are getting old enough where I can start making them again! Thank you Mimi! Hope you guys enjoy them 🙂 Have a great weekend! I will totally enjoy the deep color while munching on one of these! Cherry pops are exactly what I need now! These are gorgeous! I’m glad you use frozen cherries because, not only do I always have some in my freezer, but I have the same problem as you with fresh cherries :). How are they so delicious? It’s HOT here (no surprise) so I need to whip up a batch of these beauties for the weekend. Happy almost-Friday, Dawn! Thank you Kelsie!! Hope you enjoy them 🙂 Happy weekend! Wish I could just reach through the screen to have one of your ice pops right now – the dark red colour is just incredible and I love how you made them vegan & gluten free. I have a vegan friend visiting soon so I am sure she’ll appreciate something so summery & delicious! Have a wonderful weekend ahead, my friend! Haha! The patience to let things freeze has always escaped me, too, Dawn. 🙂 Well, that is, unless I forget about it entirely and then find it a month later. (Not that it’s ever happened or anything. *ahem*) I love the cherry + vanilla flavor you’ve got going on here…and great tip on the vanilla almond milk, too! I hope you and the husband have a popsicle-filled weekend, my friend! Right?! Been there 😉 Thanks David! Have a lovely weekend too! Perfect for cherry season Dawn! So incredibly easy too. Just what summer ordered! Pinned! Thank you Mary Ann! They really are 🙂 Have a great weekend!